Escambia operating at a Mattress Warehouse Fire. Three Rams & a Tower Ladder. Im so P R O U D!! I love BIG Wter! These are the three last steps you take as an engine company on your way to fire extinguishment. That is the order – NOT attack, charge, bleed. 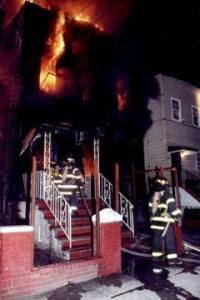 You charge your hoseline, you bleed the excess entrained air from the line and you attack the fire. Charging the line is more than pulling a handle. It involves knowing what size line has been pulled and how much hose has been stretched and the type of nozzle being used. Those are the big numbers that the pump operator must calculate so that your hoseline has the correct pressure. Elevation and target flow requirements finish off the equation. Flashback to get you thinking about back to school. Only a few weeks away. Will be posting Back To School Part Two in Late August.